JJ Bootleggers is a 1930's prohibition-style bar, and one of Pennsylvania's first moonshine themed bars in Philadelphia. 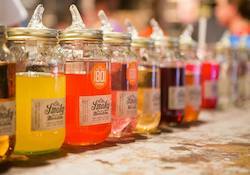 The popularity of moonshine has grown over the past few years since it has become legal to product. JJ Bootleggers offers a wide variety of moonshine and moonshine cocktails, and also a selection of beers.